The global mosaic has been overlain with transparent, colorized topography data wherever on the surface stereo data is available. Terrain south of about 30°S was in darkness leading up to and during the flyby, so is shown in black. 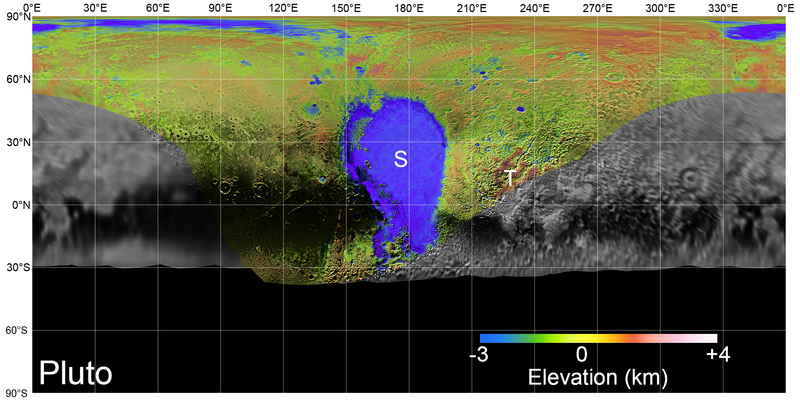 Examples of large-scale topographic features on Pluto include the vast expanse of very flat, low-elevation nitrogen ice plains of Sputnik Planitia ("P") – note that all feature names in the Pluto system are informal – and, on the eastern edge of the encounter hemisphere, the aligned, high-elevation ridges of Tartarus Dorsa ("T") that host the enigmatic bladed terrain, mountains, possible cryovolcanos, canyons, craters and more. Mosaics and topography maps are also available in equirectangular projection at an equatorial pixel scale of 300 meters (985 feet) per pixel, and in uncompressed jpeg format as well as in cube format; the latter can be read using the USGS ISIS Planetary Image Processing Software. All maps were producing using radii of 1188.3 kilometers/738.3 miles for Pluto and 606 kilometers/376.6 miles for Charon. The JPEG of the grayscale Digital Elevation Maps (DEMs) for Pluto display an elevation scale stretch of -3 (black) to +4 (white). All of these map products will be delivered to NASA's Planetary Data System (PDS) in fall 2017.